With the mood WBC heavyweight king Deontay Wilder seems to be in right now, it takes a brave man to want to get in the ring with him. Chris Arreola has never been short on courage, as we know, and he will take the challenge on Saturday night. Arreola knows he’s up against it and he has trained hard to make the most of his short-notice opportunity, but Wilder is vowing to not only knock him out, but also send him to the hospital. 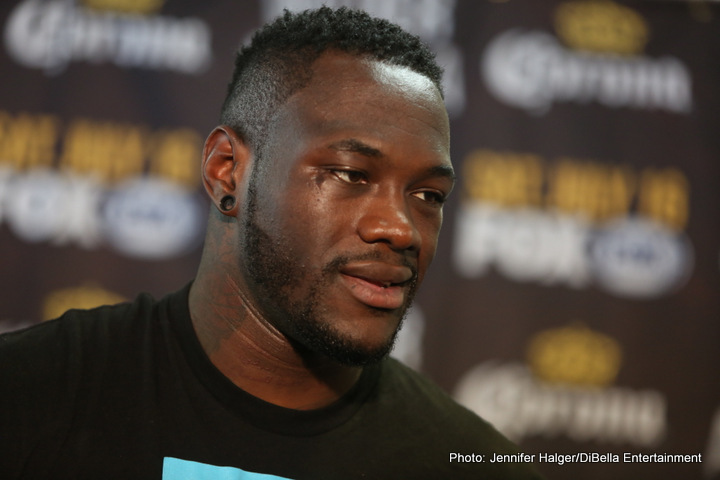 Speaking with the media, and quoted by Fox Sports (and filmed by FightHub) Wilder said he is expecting plenty of pressure from Wilder – “this is Chris Arreola we talking about, all he knows is pressure,” he said – and he is looking forward to it. This pressure, Wilder said, keeps him moving and he likes a testing fight. Can Arreola give him a test? With the dynamite he has in his right hand, Wilder is capable of taking out any heavyweight in the world at any given moment, but what about his own chin? Still largely untested, Wilder’s chin has taken some good shots from time to time (he was wobbled by Eric Molina in his first title defence) and it might have to take some more in a couple of day’s time. Arreola won’t be fazed by such talk, but it seems we can expect an aggressive Wilder on Saturday, with him perhaps being more aggressive than he has been in some of his previous fights. Wilder can box well, he has those long arms and quick feet, but he seems to be heading into this fight with the idea of releasing some stress by way of scoring a crowd-pleasing KO. Is there a chance Wilder will be a little too reckless in his bid to inflict pain? Maybe so, and maybe Arreola’s best chance will come as a result of Wilder throwing more than enough leather for his chin to be left exposed. As Arreola has said, it only takes one punch to end a heavyweight fight. This one is almost certain to end via a highlight reel KO; one way or the other. Has anyone even bothered to check the odds of Saturday’s fight going all 12-rounds, much less place a bet on such a result!